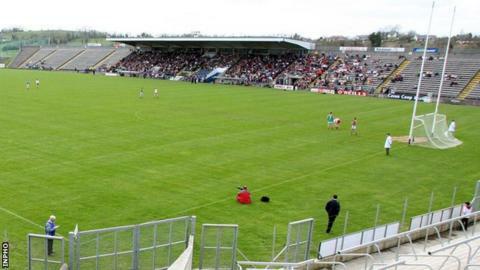 Breffni Park in Cavan has won the race to become the first Ulster venue to stage an International Rules game since the series was revived in the 1990s. It will host the first match of Ireland's 2013 series against Australia on 19 October with the second game at Croke Park in Dublin a week later. The news will come as a disappointment to Derry's county board who had wanted the game to come to Celtic Park. Ireland hold the Cormac McAnallen Cup having won the 2011 event in Australia. In addition to the games that have been played at Croke Park in recent times, Pearse Stadium, Galway and Páirc na nGael, Limerick have also staged games. GAA president Liam Ó Néill congratulated all involved with Cavan's successful bid. "It is an acknowledgement of the facilities that the Cavan County Board, with the support of others, have developed at the venue and I have no doubt that its location will prove popular. "I hope it will be an occasion to remember for what is a famous venue."